Chocolate Chip Cookie Dough Fudge – delicious easy microwaveable fudge that tastes just like chocolate chip cookie dough for an easy dessert everyone loves! I know it might seem early- but I am full in the swing of planning Christmas gifts for family, friends, neighbors and teachers. 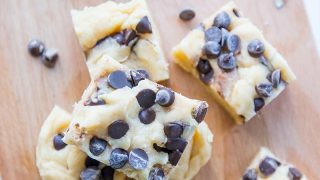 I love to give delicious, fun, and unique gifts during the holidays- and this recipe for Chocolate Chip Cookie Dough Fudge is a fabulous gift! This fudge isn’t just great at Christmas- it is great any time of year- but you can’t go wrong with everyone’s favorite cookie flavor in fudge form! I like to give fudge in cute mason jars when giving as a gift. 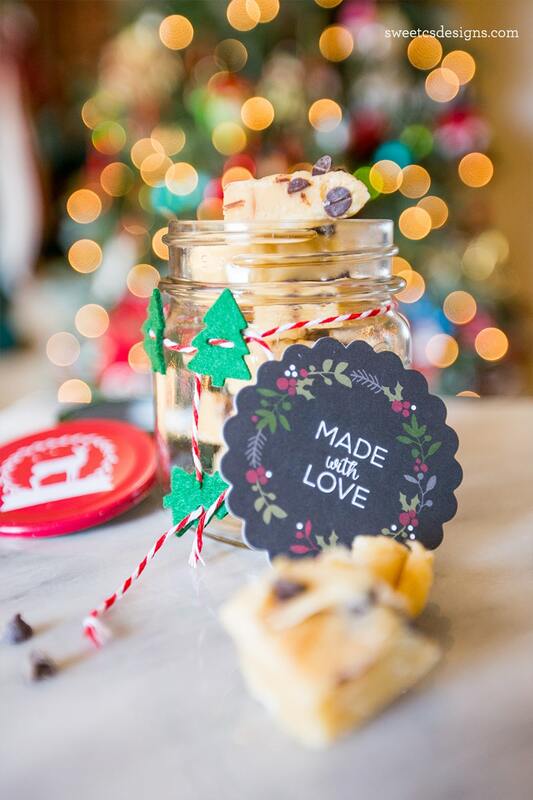 How cute are these jar toppers, twine, and tags from Joann Fabrics and Crafts? This fudge is so simple and easy- you can make it in the microwave and stir, then let it cool and set! It takes just a few minutes active time and about an hour to set in the fridge- so it’s a perfect last minute gift! 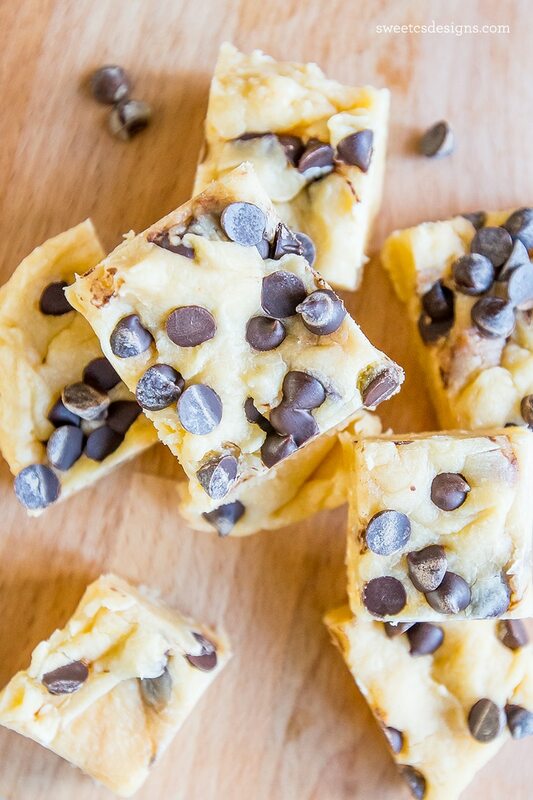 If you love this easy chocolate chip cookie dough fudge recipe as much as I do, please give a five star review and help me share on facebook and pinterest! If you share on Instagram, please tag @sweetcsdesigns or #sweetcsloves so I can see! Chocolate Chip Cookie Dough Fudge - delicious easy microwaveable fudge that tastes just like chocolate chip cookie dough for an easy dessert everyone loves! Add dry pudding mix and stir until mixture becomes thick and creamy. Add chocolte chips to fudge and stir quickly (don't overstir or they will melt into fudge). Previous Post: « Breckenridge, Colorado – a Foodie Weekend! 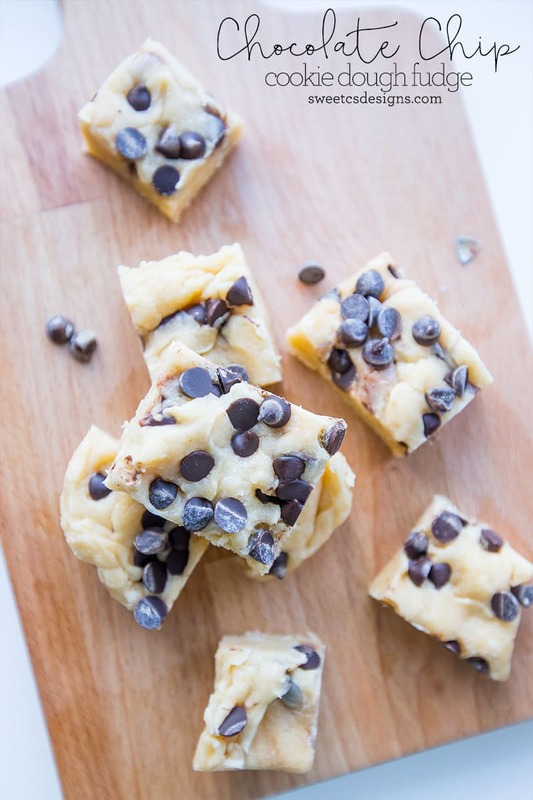 I’m going to try your Chocolate Chip Cookie Dough Fudge, it’s unusual & looks like it is so good! TY! Oh my gosh…this is SO up my alley, it’s not even funny. Sounds DELISH. Thank you so much for being a part of Snickerdoodle Sunday- hope you’ll return for more fun tomorrow! ooooh! This looks incredible! Thank you so much for sharing your recipe with us at Snickerdoodle Sunday! Pinning and Tweeting! Would be perfect for gifts too! Have a fabulous Holiday! wow looks amazing and is so easy. wondering if any pudding mix, like say vanilla, would work, hmmmm. Thanks so much McKenzie! Love your blog and your gorgeous photography!